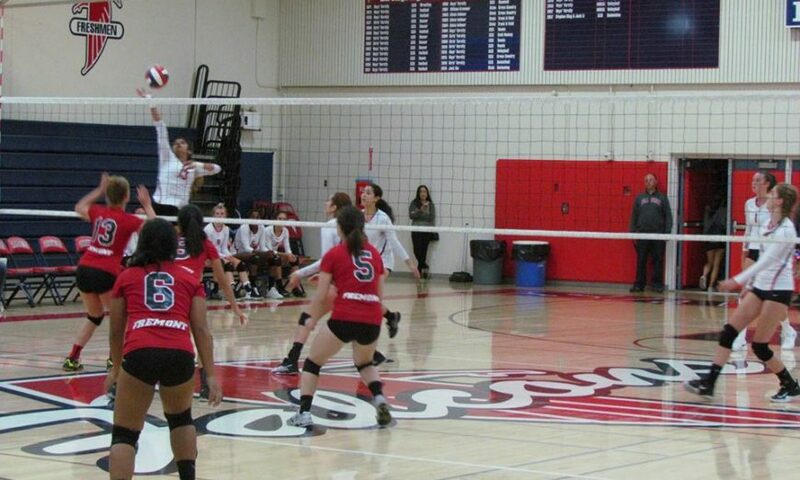 Thursday’s volleyball match between Saratoga and Fremont featured some ferocious flocks of Firebirds and Falcons. There weren’t any lions, tigers nor bears, but it was certainly an “oh my” kind of night with unbelievable digs, kills and aces aplenty. Eventually, it was the Fremont Firebirds escaping with the victory, winning a five-set marathon 22-25, 25-21, 23-25, 25-21, 15-12. 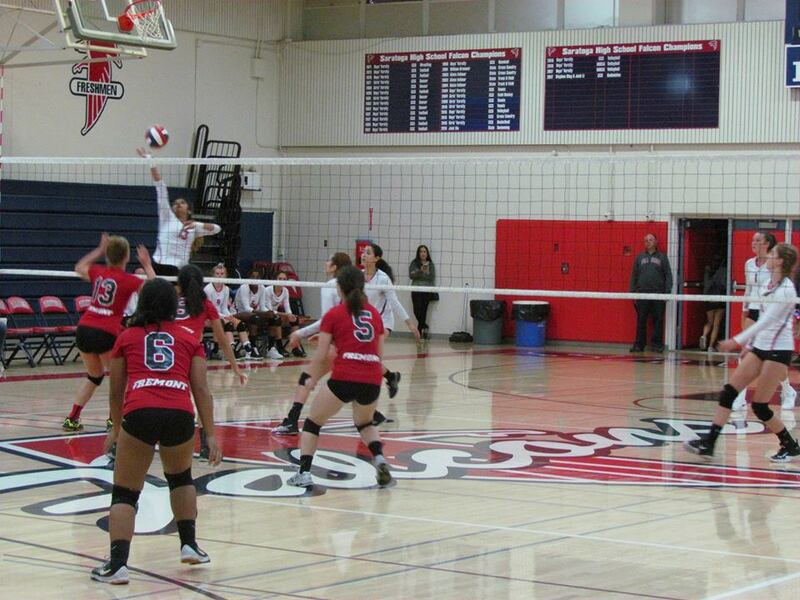 The two schools came into the match jockeying for third place in the El Camino League standings. Fremont began the day at 4-3, while Saratoga started at 3-3. With the win Fremont improves to 5-3, sweeping the two-game season series from the Falcons. Fremont now holds a firm grasp on third place and could potentially catch 7-1 Gunn for second. Fremont would need to win each of their final four matches to finish 9-3. Three of the four remaining games are against each of the three bottom teams in the division. The lone other match is a head-to-head match against Gunn. If Fremont can run the table and beat Gunn, they would only need Gunn to lose to first-place Cupertino in order to finish tied with the Titans at 9-3. A lot of things would have to fall Fremont’s way for that to happen, but the ball was certainly falling their way on Thursday. Captains Joanna Wu and Aleksandra Davila played key roles as usual, but the supporting cast all played pivotal roles in this one. Sophomore middle blocker Catrina Tan was named the player of the match, but Fremont also got critical contributions from Kelly Mahoney, Kylie Johnson and Emma Schulze. Schulze was a go-to outside target all match long for Fremont setter Joanna Wu, and the Firebirds needed every one of those kills. While Schluze’s hitting was certainly on point, her coach was quick to point out her ability to serve. Certainly, some of that aggressiveness — which the team displayed on Thursday — is contagious. And that tenacious play starts with Wu and Davila. The two senior captains certainly do not hesitate to take control of the game when a big play is needed. When the Falcons were on an 8-0 run late in the third set, it was Wu who took things into her own hands. After bumping a powerful spike from Saratoga, Wu wanted the ball back immediately. On the third hit of the sequence, she delivered a forceful kill for a crucial side out. Fremont would go on to lose the set, but the clutch kill made the score 23-19. The Firebirds went on to score five of the next six points to pull back within 24-23. In the fourth set it was Davila who came up with the biggest “oh my” play of the set. With Fremont leading 20-16, Saratoga delivered a ball that tipped the top of the net and was falling in for a point. Davila, though, seemingly came out of nowhere with a full-extension dive, digging the ball up and keeping the play alive. Fremont would eventually win that point and the set, pushing the match to a decisive fifth. The Firebirds now have a week off before taking on Santa Clara on Oct. 11. Five days later, on Oct. 16, will be their biggest match of the season when they play at Gunn. A win in that game could possibly set Fremont on course for a second-place finish.